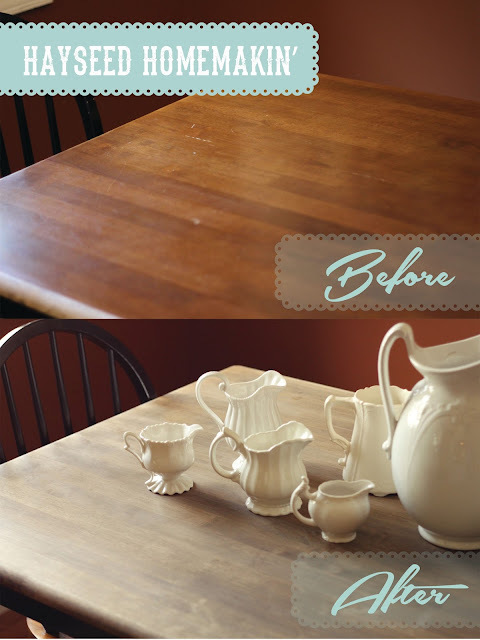 Here is a quick afternoon makeover that turned our inexpensive Better Homes & Gardens Dining Set into a rustic farmhouse table. It was a simple project that takes more patience than skill. I started by carefully coating the tabletop & bench seats in Citristrip Paint & Varnish Stripping Gel, avoiding the black parts of the dining set. (Follow the directions on the container, it is VERY simple to use.) I like this gel because I can safely use it in the house. I used a taping knife to scrape the gel/varnish. I let the Citristrip sit for 30 mins before scraping (I probably could have waited longer...) & I then repeated the process one more time. After I let the table dry, I applied my favorite Minwax Dark Walnut Stain with a clean rag. I applied two coats of the stain, letting the table dry between coats. Once the stain dried, I lightly sanded where I wanted to see a little more "wear & tear" (mostly edges). My next step is to apply the Minwax Paste Finishing Wax (Natural), just to give the table a protective coat. This is a very heavily used table and we have gone two weeks without a protective coat (just the stain) without any issues. The wax will just add a little more luster to the finish & make the table a little easier to wipe down after meals with two toddlers. I AM LOVING our "new" table! It's so much more fun to decorate now that the color is more neutral & more rustic. I so, SO need to do this to a number of tables in my house...I have the citistrip, I just need to START! Looks great! Can you provide suggestions for how you stripped the stain off the chairs with the spindles but still left on the black paint? Unfortunately I do not have benches with my table (very similar to yours) and would like to put something on the black paint so it doesn't come off. Thank you!